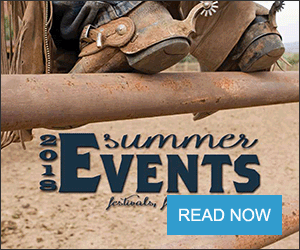 With the bulls-eye of the lingering drought dangling precariously in the Four Corners region of the southwest U.S., ranchers, farmers, ski resorts and others in the southwest are closely eyeing the latest three-month forecast from the Climate Prediction Center. The CPC officially released its winter outlook on Nov. 15 with the anticipated El Nino impacting this winter season. "The CPC is forecasting an 85 percent chance of El Nino this coming winter (December 2018 into January and February 2019,) and in all likelihood, this will be a weak El Nino event," said Victor Murphy, National Weather Service/Southern Region Headquarters Climate Services program manager. Given the start to the snow season in Colorado, a climatologist at the Colorado Climate Center on the campus of Colorado State University is feeling fairly positive about this winter's outlook, especially compared to last year's snow drought (the critical lack of snowpack). "Most of Colorado saw well above-average precipitation for October (2018) and cooler than average temperatures have dominated since the beginning of October. 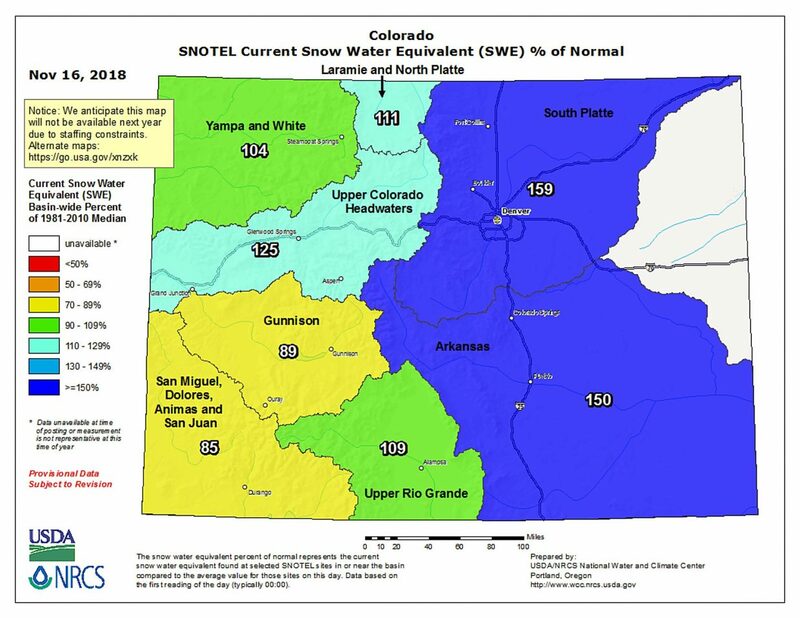 Snowpack has faltered a bit in some areas (like the San Juan mountains), but we've had a strong kickoff to the snowpack accumulating season, especially along the Front Range mountains and Sangre de Cristos. Given the last two years (warm and dry October and November), this is a very promising start," said Becky Bolinger, PhD assistant state climatologist, Colorado Climate Center, Colorado State University Department of Atmospheric Science in Fort Collins. Interestingly, regarding Colorado's forecast for the next three months, Bolinger said, "It is somewhat of a surprise to see that the CPC has extended their increased likelihood of wetter than average conditions to cover all of Colorado. I feel more confident in that forecast around southern Colorado and maybe the eastern plains. 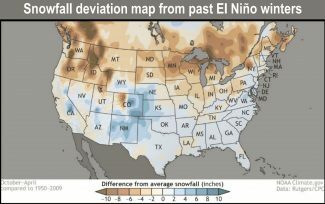 With the development of an El Niño, the southern Colorado high elevations are more likely to fare a bit better with winter precipitation, and the eastern plains of Colorado tend to see slightly higher seasonal snowfall totals in an El Niño." 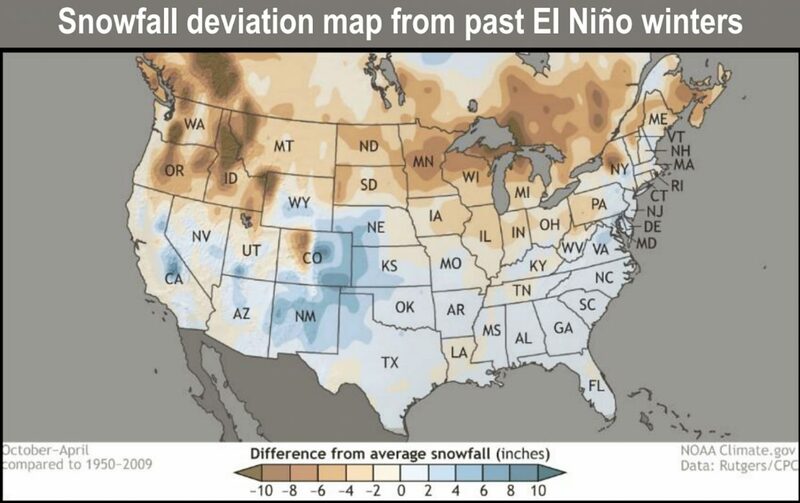 Bolinger said however, "That El Niño connection gets a bit more murky as you head north, especially north of Interstate 70. The northern Colorado mountains typically receive less snowfall than average in an El Niño winter," Bolinger said. 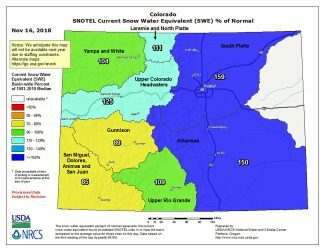 "Right now, I'm telling people: I think the El Niño is good news for southern Colorado this winter, and should help alleviate some of the drought conditions there, but there's more uncertainty about the northern part of the state." Winter in Wyoming has a 40 percent or greater chance of above average temperatures in December, January and February. "Those chances increase going from the southeast toward the northwest. 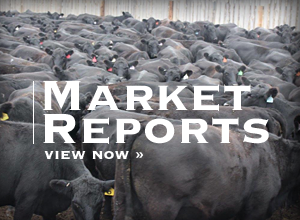 However, things are less certain for Wyoming's precipitation over that December to February time period," said Tony Bergantino, deputy director Water Resources Data System, Wyoming State Climate Office and Wyoming CoCoRaHS State Coordinator. Chances for precipitation in Wyoming are somewhat greater. "We're expecting above normal precipitation over that time-frame in the southeastern parts of the state, ie the Little Snake, South Platte, Upper North Platte, Laramie and parts of the Lower North Platte river basins. But, for the rest of the state, there is no dominating signal that would push the outlook one way or the other so the odds of above, below, or just normal precipitation are all about the same," Bergantino said. "The areas of long-term drought in the south central and southwest parts of the state are expected to persist through this next three-month outlook." A meteorologist with the U.S. Department of Agriculture notes the winter precipitation forecast is in sync with the expected 80 percent chance of an El Nino development. "However, regarding the unusually wet autumn in the Plains, it has already been a struggle this autumn for winter wheat producers to complete final planting efforts, especially across the central and southern Plains. Furthermore, late-planted wheat has had some difficulty in germinating and becoming established, and some young wheat fields have drowned in all of the wetness and will have to be abandoned or replanted. This could result in a lower planted acreage than originally expected," said Brad Rippey, USDA meteorologist, Office of the Chief Economist, World Agricultural Outlook Board in Washington, D.C. As of Nov. 11, winter wheat emergence was behind schedule in most major production states and, even where the crop has emerged, growth in some cases has been stunted by cold weather and wet conditions. However, a mild winter, (as indicated for the Plains and northward and westward) would likely be favorable for wheat, Rippey said, in that producers might see some additional crop development prior to full dormancy. A Nebraska climatologist said the CPC's December temperature prediction is pretty close, but should have included at least the northern one-third of North Dakota, Minnesota and Wisconsin. The northern jet stream, and other weather features continue to filter cold air into the upper Midwest. "And the intensity of that cold gives me reason to believe that it will likely extend into early December," said Al Dutcher, associate state climatologist, Nebraska State Climate Office in Lincoln. Regarding Nebraska's precipitation for December, "That really has me scratching my head. The dominant trend these past three months has been dry in the northern Rockies and Pacific Northwest, then wet from the southern Plains north-northeastward though the eastern U.S. The southern jet has become more active and cold air penetration has been sufficient to produce snow as far south as the Gulf Coast states. Therefore, I don't 'buy into' the forecast for extensive wet from the Pacific northwest through the western half of the Dakota's, possibly as far south as the northern half of the Nebraska Panhandle," Dutcher said. Nebraska's January and February precipitation outlooks are near average. "Temperatures should show a cooler than normal bias where they depict above normal moisture, especially for the Gulf Coast states that typically get the brunt of activity from an active southern jet (usually the strongest of the two jet streams during El Nino winters). Computer models are indicating that the Aleutian Islands upper air flow will begin sending energy underneath the ridge in the eastern Gulf of Alaska (not displacing it) and direct those pieces of energy towards California, and subsequently pushing eastward as it is caught by the southern jet. As this energy undercuts the Gulf of Alaska ridge, the ridge will remain fairly stationary, allowing cold polar air to ride down the front of the ridge," Dutcher said. "In order for above-normal temperatures to expand across the northern Plains (creating a split flow between the two jets streams), this high-pressure system would need to expand eastward by several hundred miles so that the cold air is directed toward the Great Lakes instead of the northern Plains (presently). Nailing the forecast for the end of winter is more tricky, Dutcher said. "The longer the event (El Nino) holds on into the late winter and early spring, the more likely warmer conditions will last into the early spring. If the event dies rapidly (which isn't supported by the extensive area of above normal temperature below the surface from Indonesia to South America), the return to the battle between the northern and southern jet would resume to bring an active and changeable temperature pattern like we experienced this fall," Dutcher said. Meanwhile, the southern Plains should have no moisture problems for the wheat crop, in fact, excessive moisture is likely to a bigger issue, especially late this winter into next spring, and El Nino conditions begin to weaken," Dutcher said. A Kansas climatologist noted the latest CPC outlook released Nov. 15 doesn't vary much from the earlier release, with the El Nino favoring wetter than normal conditions across the Southern U.S.
"The precipitation outlook is equally likely to be above or below normal. The forecast is based mainly on trends (for temperature) and an El Nino pattern in the Pacific," said Mary Knapp, assistant state climatologist located at Kansas State University, Department of Agronomy, Manhattan. She said, in the Central Plains, there is a slight tilt towards warmer-than-normal temperatures. El Nino conditions occur when unusually warm ocean water accumulates in the central and eastern tropical Pacific region, and has a global impact on weather patterns. In an El Nino season, the Pacific jet-stream; responsible for bringing storms, shifts south and moves east from southern California to the Four Corners, into Texas, Oklahoma, Georgia and the southeast coast. As Bolinger put it, "In Colorado, we're in a very important time right now, where consistency is key. A few warm and dry weeks can derail any positive strides made. Once we get to January and can assess how the snowpack accumulations have been evolving, we'll be able to say a little bit more about this winter season. Until then," she said, "if it's bad, remember — it's still early." For more information, go to http://www.climate.gov or https://www.climate.gov/sites/default/files/styles/featured-image/public/Snowfall_ElNinoComboMap_620.png?itok=LcvgqVk4 or https://iri.columbia.edu/our-expertise/climate/forecasts/enso/current/?enso_tab=enso-cpc_plume).